Ginger Zingiber officinale has been used as a medicinal herb across the world for thousands of years for its ability to promote healthy gut bacteria, improve digestion, decrease inflammation, support cardiovascular health, aid menstrual cramps, stomach aches and alleviate nausea. 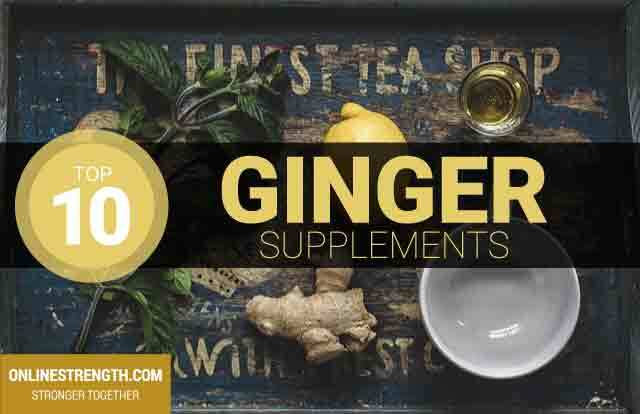 Onlinestrength analyzed 10 best-selling Ginger supplements in the United States, measuring total ginger content, ingredient quality, and recording precense of preservatives, fillers, and binder ingredients. Products which used organically grown, non-GMO, kosher ginger root were ranked higher than those that had an unknown source. Following our very strict review methodology products that had any preservative ingredients were penalized accordingly. Supplements that had higher quality ingredients but had gelatin-based capsules ranked lower than supplements that had both quality ingredients and plant-based capsules. Ginger is a part of the zingiberaceae family and is grown in sub-tropical areas in the southern hemispheres. Clinical research regarding ginger supplementation has shown to have positive effects on inflammation and as a beneficial nausea aid. The volatile oils found within the ginger root are responsible for its nutritional activity. Ginger helps to promote healthy bacteria within the gut and stimulates digestive enzymes to secret more bile from liver and gall bladder which is important for optimal food digestion. Ginger may boost absorption rates of other supplements when taken orally. Ginger may help alleviate pregnancy-induced nausea and vomiting. Ginger root dosage: 250 mg – 1000 mg take one to four times daily depending on type of treatment. 1000 mg – 3000 mg daily dosage seems to help prevent and treat nausea caused by morning sickness, vertigo, and motion sickness. For digestive aid and immune system boosting benefits 1000 mg is typically used and seems to be the most effective dosage.